Volunteering is directly proportional to Happiness. This relationship is established by major researches for instance: A study conducted by London School of Economics examined the relationship between volunteering and measures of happiness in a large group of American Adults, the results showed, the more people volunteered, the happier they were. There are explanations that back this relationship of volunteering and happiness. The most prominent benefit of volunteering is, it connects you to others. Volunteering enables you to get involved in your community and make it a better place. Extending your aid even in the minor tasks can create a real difference to the lives of individuals, animals and organizations in need. Devoting your time as a volunteer helps you make new friends, increase your network, and boost your social skills. Committing to a shared activity together could be one of the best ways to make new friends and strengthening existing relationships see (article link of the web developers at SRSC). While some people are extroverts, others are a bit reserved and have a hard time meeting new people. Volunteering paves the way for you to practice and develop your social skills, since you are regularly meeting new people with similar interests, it gets easier to open up and make more friends and contacts. In addition, Volunteering is advantageous for your physical and psychological health. The sense of connectivity you feel while you work and help others has a profound impact on your overall psychological health. Nothing relieves stress better than a meaningful connection to another person. When you work for a social cause, you regularly meet people and in the process develop a strong support system which becomes your defense mechanism against depression. Research reveals that helping others delivers immense pleasure, Humans are designed to give, and the more we give the happier we feel. When you do well for others and the community, a natural sense of accomplishment is invoked. Your role as a volunteer fills you up with a sense of pride and identity. And the better you feel about yourself, the more likely you are to have a positive outlook on your life and ambitions. Moreover, Volunteering can help you gain experience in the field of your interest and meet people with expertise in such field. 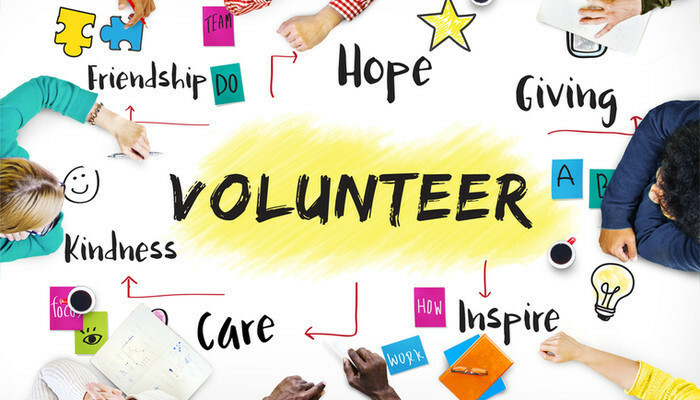 Volunteering gives you the opportunity to practice important skills that could come in handy at the workplace, such as communication, problem solving, project planning, task management, teamwork and organization. Once you gain the momentum with these skills during the volunteering, it is highly likely you will be more comfortable at work. Volunteering could become a source of fun and fulfillment in your life. It is a convenient way to explore your interests and passion. When you volunteer for a cause that is meaningful and interesting, you escape your day-day routine and relax. It also provides you with diversity, which induces creativity, motivation and vision that you can carry onto your personal and professional life. A lot of people volunteer to make time for things they want to do outside of work for instance: if you have a sedentary job, and you long for outdoor activities, you may consider volunteering for a sports event, or help out at a children’s camp. You may take some time to identify your goals and interest and then make efforts to volunteer accordingly doing so would result in a much richer experience. Opportunities that match both your interest and goals are most likely to be fun and fulfilling. These surprising benefits of volunteering including: making connections, improved physical and mental health, advancing your career, and bringing fun and fulfillment to your life; when combine with the actual impact that is left on the community and people around you, make the life worthwhile and bigger than anything else. At some point in our lives, most of us experience an idea or a project floating in our minds and I refer to it as floating because it is suspended and fluctuating striking from time to time due to some questions that hold us back from taking an initiative. For instance: Will this project be Profitable? Will I be able to pay monetary rewards to the people who contribute to the project? When you take astray the idea of monetizing, your project at that moment becomes a volunteer project. The first and foremost thing, before everything else, is to step up and take the initiative in order to make that volunteerism project happen. The core element in this initiative has to communicate and share your IDEA to the people around you. Let people see what is it inside your head that you are so passionate about and while you do it, you are going to find like-minded people who share the similar excitement and might be able to take your project to the higher level. And before you realize it, you will be consumed in actually planning and launching that project. Once it is done, SHARE your KNOWLEDGE. Every individual that you come across regardless of their backgrounds have some valuable information that you can learn from and vice versa. It can vary from tiny little daily life hacks to something much bigger. The third step is to SHARE your EXPERIENCE imagine yourself volunteering with a diverse group of individuals and in the process you get yourself equipped with a skill, through their experience, which helps make a difference in your daily life. Similarly you could be doing the same in someone else’s life through your experience and that too without dedicating ourselves to its study or taking up a new profession. Realize the magnitude of that impact, how the world is getting better and you are an agent to that. Comes the turn for the most important aspect, Share your PASSION. When you start a project, when you do something that matters to you, you need to be passionate about it, you need to show that excitement because if nothing else, passion is extremely contagious. It will inspire the people around you, incite that energy in them that gets things done, resultantly providing a flight to your project. The last thing that I feel you need to SHARE IS the answer to the question, WHY DO PEOPLE VOLUNTEER? There are two aspects to the answer. First is, it holds intrinsic values in it to provide you that internal motivation and a satisfaction in terms of spirituality. Second is that, it is a fun. You learn a great deal, meet diverse individuals, your networking improves and your skill set is enhanced. It is a win-win and signifies something bigger in this commercialized society. In the end, I would urge you to think about that idea you had once for the project and consider it for a while. Implement these five things that you can share in that idea and imagine what it can do for you as a person and how it can change the people that might get involved and how it can contribute to your community and how it can change your world.